We spend our monotonous life working in order to survive, to build our own homes, to look after our families, to shape our future and toil hard so that life blesses us with all kinds of prosperities. We believe that human existence lies in just staying alive so we forget to find a worthy reason to live for. It does not matter how long we are on this earth and how much money we have acquired but the amount of positive vibration we have radiated is all that counts. When we help others and contribute to shaping their lives it fills us with a certain sense of self-dignity and gives happiness. It is our compassionate act which determines that we have lived a purposeful life and have lived it well. The people of Canada are too generous in terms of giving donations to charities or volunteering for these organizations. Majority of Canadians have likely donated or volunteered with a charity organization at some point in their lives and may contribute to them daily. Over 170,000 charitable organizations and NGO’S are operating in Canada and only 85,000 of these are registered charities and are recognized by the Canada Revenue Agency. The Charitable and Nonprofit sector contributes 8.1% of total Canadian GDP which is more than the retail trade industry. About 2 million employees are working in the Charitable and NGO sector. So when we are donating to the Charitable organizations in Canada, we are both helping the needy and contributing to the country’s economy helping it to progress further. CanadaHelps is a nonprofit serving Canadian charities and donors. 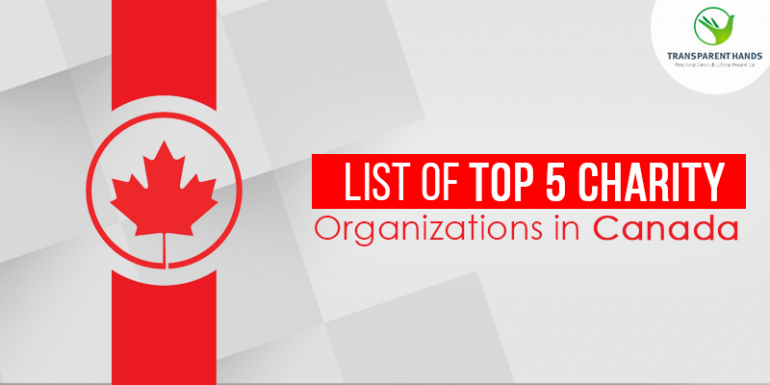 CanadaHelps is in First position in our List of Top 5 Charity Organizations in Canada. They are dedicated to increasing charitable giving across Canada by making it easier to donate and fundraise online. Because they’re a charity, their fees are a fraction of the for-profit alternatives, so your donation dollars go further when you give using CanadaHelps. At CanadaHelps, they believe every charity deserves the important advantages that online technologies and education can offer. As a charity serving charities, they play a critical role in the charitable sector. Be a part of one of Canada’s first social enterprises. They’re a small organization with a big mission: to increase charitable giving all across Canada. It takes work. But one of the nicest things about the hours they spend at CanadaHelps is spending them with a group of dedicated people. Even better is knowing that they work to directly support thousands of other charities fulfill their missions, which ultimately strengthens their local, national, and even global community. A job at CanadaHelps offers the chance to expand your professional skills and experience in the fast-paced environment of a technology organization. It also means applying those skills – old and new – to the rewarding task of helping others. TransparentHands is in second position in our List of Top 5 Charity Organizations in Canada. We are blessed with good health and wealth and it’s their duty to further utilize them for the service of mankind. Even a small amount can create a lasting impact on someone’s miserable life. Spend your wealth in a noble cause and change the lives of deserving people of Pakistan. The amount which you’ll contribute towards the surgeries of these poor patients will bring them back to better health and improve their living. FundRazr is in third position in our List of Top 5 Charity Organizations in Canada. FundRazr is a crowdfunding solution that is laser-focused on eliminating the guesswork of raising money online for your campaign. Their thoughtful technology and expert social media guidance make telling your powerful story easy; sharing it with the widest community simple; and collecting the money worry-free. Thousands of people just like you use FundRazr to reach their friends, friends of friends and beyond, convert them to supporters, and raise money for causes close to their heart. Raise money the way that suits you. Choose Keep it all to access funds immediately. Or choose All or nothing to charge supporters after you reach your goal. Either way, you never pay extra fees or penalties. FundRazr can be used in any country with the ability to send and receive payments through PayPal, and in 25 currencies worldwide. U.S. and Canadian users can also accept funds via WePay. Full campaign functionality on your website or blog & full campaign functionality on your Facebook page will increase your campaign’s visibility and help supporters find a way to donate to your cause. Easy and secure payments by PayPal, credit card, bank card or WePay. Your donors’ privacy is respected, your funds are safe, and money received is immediately deposited into your account. Enhance your fundraising campaign by providing perks, products, tickets or wishes. Incentive images and share feature create more engagement, sharing and social media visibility. Contributors pay no fee. Recipients pay 5% FundRazr fee plus Payment Provider fee of 2.9% + 30¢ per transaction. There are no additional fees or penalties. FundRazr was launched in the summer of 2010 with an enthusiastic team led by CEO and crowdfunding pioneer, Daryl Hatton. They understand the difficulties of raising money, and they are passionate about providing an alternative funding source for startups, charities, and personal causes. They believe in the power of community support and sharing your story with the world. Ultimately, they want to build great company, have fun, and help people in a meaningful way. So far, FundRazr has helped raise over $69 million from over 45,000 campaigns in dozens of countries around the world. They believe in creating a platform that is easy to use, inexpensive, and can leverage the power of the internet community. Contrary to some other crowdfunding platforms, their platform does not limit the type of campaigns they host. They want to be flexible and available to everyone, for any kind of cause, from almost anywhere in the world. With a team of 5 at inception, FundRazr has more than doubled in size since then. Located in the heart of Gastown in Vancouver, Canada, FundRazr is at the hub of all things entrepreneurial. They work hard and innovate every day so you can be the next fundraising success story. GoGetFunding is in fourth position in our List of Top 5 Charity Organizations in Canada. GoGetFunding empowers you to raise money for anything that matters to you. From personal causes and events to projects and more. They’ve helped people from all over the world raise millions online. They’ve been recognized by Forbes as one of the top global crowdfunding websites and their campaigns have been featured in a vast number of leading press publications. They’re dedicated to making the lives of their campaign owners, donors and visitors happier and enriched. That could range from helping you raise money for critical medical expenses, a once-in-a-lifetime volunteer trip or to launch an exciting new business. Being involved in so many personal and powerful plans, projects and causes drives their to do what they do. They read the fundraiser comments, see the updates and get incredibly excited when a fundraiser reaches (or smashes!) their target. GoGetFunding is a crowdfunding website that lets you raise money for anything that matters to you. From personal causes and events to projects and more. They’ve helped people from all over the world raise millions online. Kickstarter is in fifth position in our List of Top 5 Charity Organizations in Canada. Kickstarter is an enormous global community built around creativity and creative projects. Over 10 million people, from every continent on earth, have backed a Kickstarter project. In Canada, registered Charities are bound to keep adequate books and records at the Canadian address listed with the Canada Revenue Agency. These books and records include an NGO or Charity’s financial statements, bank statements, income tax records, donation receipts, governing documents, annual reports, accounting ledgers and fundraising materials. CRA use this record to check Charity’s revenues in terms of money it receives via donations and checks that Charity’s recourses are spent on charitable activities only. Charities operating in certain sectors like schools, hospitals, daycares and seniors’ residences must follow specific rules to those sectors. These rules deal with building codes, safety, and maintaining hygiene standards etc. 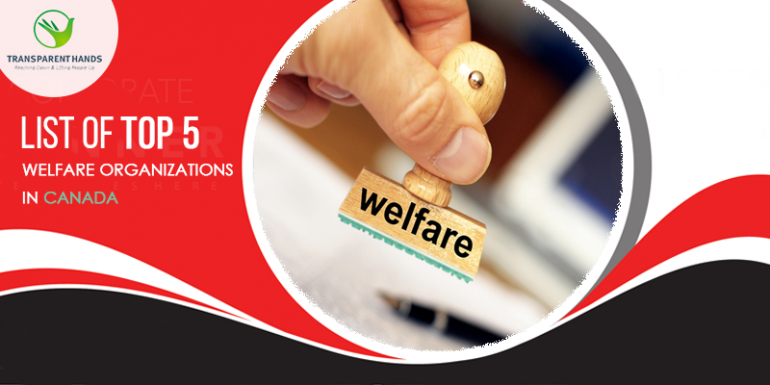 The Canada Revenue Agency has several checklists to remind registered Charities of their obligations and duty and hence they ensure transparency in all stages of charitable activities. Canadian registered Charities are allowed to supply resource and provide aid to foreign countries for disaster relief. Charities provide expertise and support to every aspect of our lives, such as healthcare, education, elimination of poverty, among many others. Hence, Charities play an essential role in communities across Canada. Charities have contributed to Canada’s public policy process and great outcomes have been achieved when charities and governments have worked together. Whenever we make a small donation we will probably help a girl to stay in school and chances are that her earning power will increase up to 25% in the future. Whenever we contribute our money to a family more than 90% of that will be invested in shaping a family’s future. Whenever we donate for healthcare, perhaps a little baby will get the nutrition she needs, then by the time she’s a toddler, she will be saved from the risk for a lifelong disability. During humanitarian crises or natural disasters, when we donate we actually enable millions of people to get access to food, safe water, shelter, and medication. Whenever it is possible we should give to charity. No one in this world has ever become poor by giving. Giving is not only about donation but it is about making a difference.